Tag Archives: do antibiotics cure STDs? This week we celebrate Get Smart About Antibiotics Week. Antibiotics, or antimicrobials as they are also called, cure bacterial infections by killing bacteria or reducing their ability to reproduce so your own body’s immune system can overcome an infection. Penicillin was the first antibiotic, and was discovered in 1924 by Alexander Fleming. Since its widespread use, beginning in the 1940s, countless lives have been saved from devastating bacterial infections. Talk about a wonder drug! Improper use of antibiotics can have dangerous consequences. Since then, different types of antibiotics have been developed to combat many different types of infectious bacteria. Classes of antibiotics include penicillins, cephalosporins, macrolides, fluoroquinolones, aminoglycosides, and others. In each of these classes there are lots of different individual medications. 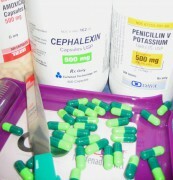 (For example, cephalosporins include the drugs cephalexin, ceftriaxone, cefaclor, and others.) Some antibiotics are broad spectrum, which means they work on many different bacteria. Some are more narrow spectrum, used for specific bacteria.